PUT YOUR HEARTBEAT BACK INTO YOUR BUSINESS. Your life depends on the beat of your heart. A strong heartbeat means good health. Same as your business…it has a heartbeat, it does have a “life”. Can you hear and feel it’s heartbeat? Is it strong…or is it not beating at all? Symptoms of a weak heartbeat. You feel successful yet hollow, have that nagging feeling of knowing things are going well (or you are trapped on a hamster wheel, spinning…stuck) but you are unsatisfied, frustrated with teams, partners, or you own communications. You know your big ideas, why don’t others? 1. Team members are not enthusiastic, are “showing up” rather than showing each other and you solutions. 2. It seems to take 10 times (or more!) longer for things to get done. Processes are slow or completely stalled out no matter how much you tell people “what to do”. New bold ideas do not find their way to your office and you see other business and people racing ahead of you while you stand still. 3. Income and ROI are slow or in the red, audience attraction is nil, and folks are confused as to the value you offer. Your foundations are no longer guided by or share purpose, and your exhausted heartbeat stops. How to get your heart beat going again. 1. Go back to the point of your big idea, your excitement and enthusiasm for your business or product to be seen, accepted, talked about and bought. That moment you decided YES, this is my reason for being. Write that feeling and idea down on paper, put it big and bold where you can see it everyday. 2. After you sit with your original story or purpose, take a “purpose pulse” survey. Ask friends, partners, teams if they know your passion, value, brand essence clearly? Are they seeing it in your product, service and communications? 3. Summarize: If the answer is a resounding YES (I know and value your true purpose) and they totally understand the value of your passion…the heartbeat is strong. If folks do not know, are not building “more” from that passion or WHAT, teams are not synched into doing from that “being”…then you have no heartbeat in your business…you have a working entity with little passion or true story connection. You are in the stuck zone of frustration. A. 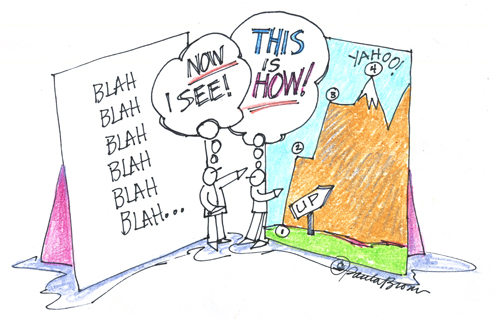 Do a purpose re-discovery…see if you are now reflecting or ignoring your WHAT. summaries, mapping out future scenarios, even for process reviews and shifts. Your business heart beats from your enthusiasm, clarity, focus, ability to communicate your purpose to others. When your heart beats strongly it connects with all who are aligned with your unique purpose. You empower their hearts to powerfully to speak the beat of their values. Make some good noise, let your heartbeat be heard, felt and seen! 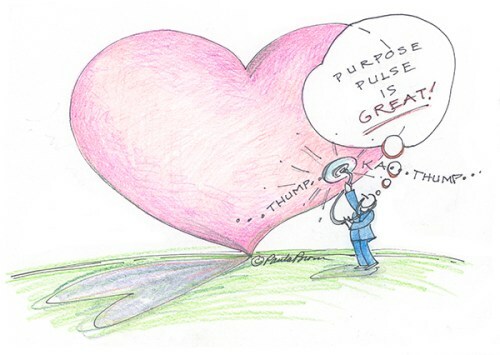 Posted in Archives	| Tagged Connect to your purpose: Put the heartbeat back into your business. 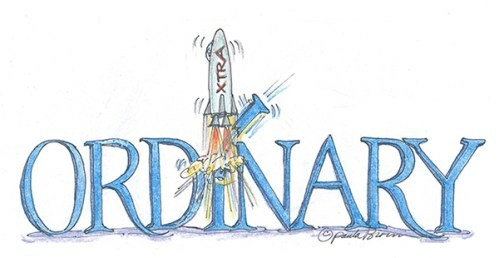 Posted in Archives	| Tagged Discovering your purpose: Find your extraordinary in your ordinary. Posted in Archives	| Tagged Is your but in the way? THE BIG PURPOSE IN HONORING YOUR “SMALL CHANGE”. “Small change”…taken literally, most of us have this rattling in our pockets, purses, in jars, in our car consoles. What’s this small change “worth”? Small change is usually referred to as “loose change”, a hassle, not worth counting OR keeping. We toss it into charity boxes, tip jars…we get rid of “it”. No value, not worth our time. Time to erase that attitude about “not worth much”, looking at each bit of small change BY ITSELF and not what it amounts to when it is all together. KA CHING! This “small change” when gathered up is worth quite a bit. Small change in business is very valuable. Small change is more digestible, comfortable, for both you and your customer. You AND your business are evolving all the time…by taking small steps, small change and then some more small change…you find and tell your story as you grow, get from where you (and your customer) are to where you want to be. Change is always happening. 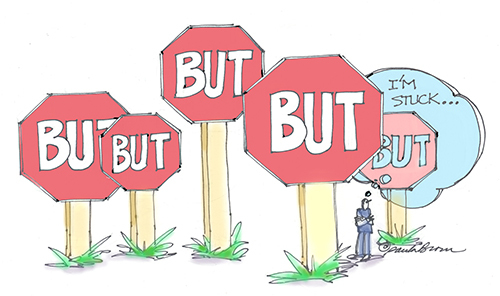 If we do not accept it, honor it, and flow with change by breaking it down into small steps of shift, then we are eventually confronted with changes that are so huge, we stop, get paralyzed…what folks say as “being stuck”. I KNOW STUCK! Being an artist, every time I begin a painting, I am confronted by a big blank canvas. HOW does that change into a painting? A painting evolves from small steps, small change. First a foundation of values is put down, then basic forms, then the juicy lights and darks, adding step by step until “finis”! Each brush stroke for an artist is a “small change” boat for the journey from start to completion. Step by step change is your ship to create safe and purposeful shift. Your step-by-step small changes create your trusty boat that takes you across the big sea of change to what you need to accomplish. Is your “boats’ hull” strong enough to stay afloat in the seas of change? To float safely through the sea of change takes a foundation made up of the true WHY, your purpose of doing business. 1. Change is the catalyst to find your unique purpose, your big WHY and HOW of doing life and business. 2. Change encourages brainstorming new process or ways to express your value, service, or product. 3. Change gives you opportunities to clarify your communication…evolving your story, aspects of your brand. 4. Change gives you a chance to see if you are being opaque or transparent with your customer base as you grow…trust me, people CAN feel and notice as you change or NEED to change. Are you listening to the sounds coming from your audience, the jingle jangle noise of needing to initiate some small changes that could grow some big positive results? I invite you to look at small change as valuable…it is. Accept small change…find and assign unique purpose in the small shifts. Step by step turn your small change into big Ka Ching valuable purposeful shift! Posted in Archives	| Tagged The big purpose in honoring your small change. Posted in Archives	| Tagged Get greater exposure by being in the "pictures"!